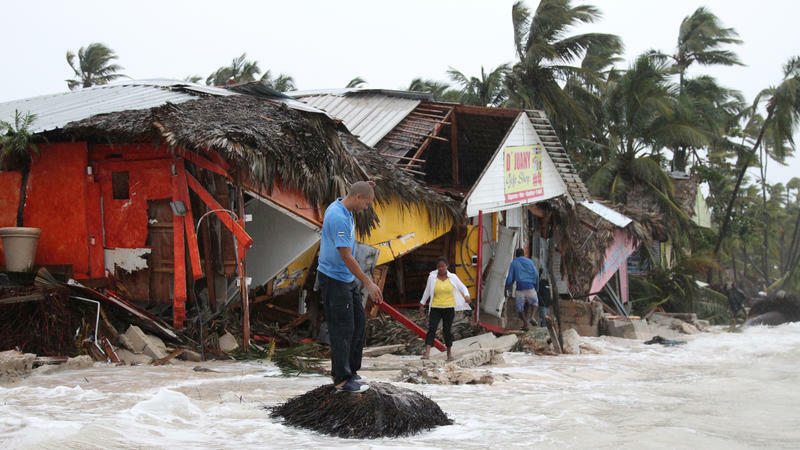 People walk among debris on the seashore in the aftermath of Hurricane Maria in Punta Cana, Dominican Republic, Sept. 21, 2017. Many countries are already trying to do that, from Pacific island states to the Netherlands. They’re trying to keep people from having to relocate. But, an untold number of people are already on the move due to climate change. The United Nations estimates that 21.5 million people have been displaced annually since 2008 due to “weather-related, sudden onset hazards,” and that there is “high agreement” among scientists that climate change, along with other drivers, is expected to increase those numbers. It’s not possible to blame any individual weather event on climate change. But scientists have been warning us that warming ocean temperatures are creating conditions for more powerful storms like we’ve seen batter the Caribbean, Houston and Florida. And then there’s the slow, steady process of coastal erosion and sea-level rise. In Alaska, Bronen is working with residents of several small indigenous communities that are threatened by flooding and erosion. Three villages have decided to relocate as entire communities. Many people and families are also being forced to relocate on their own, oftentimes in a hurry, unplanned, and not as part of a bigger community. Bronen says international human rights principles need to be created to protect communities and individuals that may be forced to migrate due to climate change. So, if we shouldn’t call these displaced people climate refugees, what should we call them? How should we refer to the phenomenon of having to move because of climate change? Mara Kimmel says, “I think that the terminology that is increasingly gaining a foothold is 'climigration.'" Climate plus migration: climigration. It’s a new word for a new problem. Whatever term we end up using, it’s a conversation that needs to be had. While climate scientists can’t pinpoint an exact number, they’ve predicted that climate change could displace tens of millions of people by midcentury.